Been using Plex for a while now with an old Dell Pentium4 and could not watch movies remotely without buffering or 1080i movies without buffering on TVs. So I decided to build a new dedicated PC to handle both Plex and VPN. 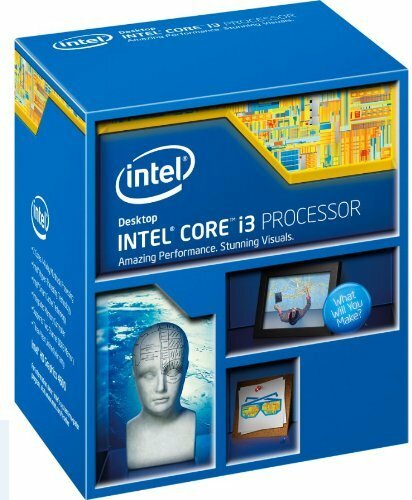 I debated between an Intel G3440 or an I3 and finally chose the i3-4350 because of the PassMarks ratings for transcoding. I tested this box with 2 remote devices one streaming a 480p and another streaming a 720p movie. The TV's are now on a gigabit network so one of them was able to stream a 720p movie without the pc needing to transcode. CPU maxed out at 80% and movies played great so am very happy with this build. Plus the motherboard has 2 1GB nics so this server will also double as my VPN server when I am working remotely. I did pay a little extra for the CPU and case fans but couldn't be happier with how quiet it made the PC while it sits working. We can be watching TV in the room and not even hear the PC until you actually get close enough to it to hear the whisper of the fans. 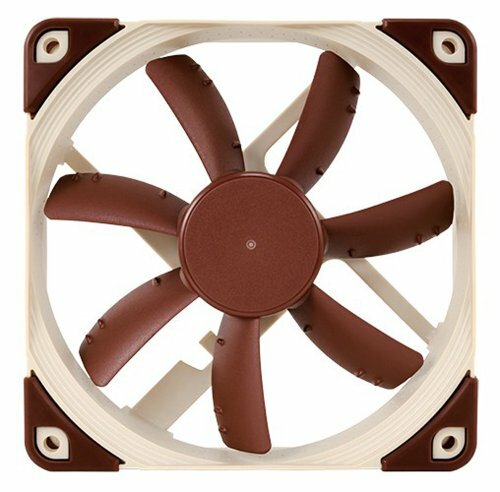 One thing I need to make known about the Noctua NH-L9i cooler is the orientation it needs to be placed at to effectively cool the CPU. Since this fan blows air DOWN into the heatsinks, I had to rotate it where the fans were not being blocked by the memory sticks. Turning it in a direction where the small 80mm fan on the back side of the case can blow air directly in the CPU fins lowered the temps a few degrees. As far as the CPU, I am surprised at how quickly the Haswell processors cool down after load has decreased. Meaning it can be sitting between 58C and 62C then in about 2 seconds drop back down to 35C then 31C sometimes 29C. I do think these new Haswell processors run hotter than Ivy Bridge because my Desktop PC that has an I3-3220 never gets above 50C but does always idle at 39C to 40C so not too concerned about that. But I am getting very good response times from this new 4th gen CPU so pretty happy with that. The hard drive was a 1TB Seagate drive I had from an older server so I just reused that one and it's pretty quiet for the most part. Every so often you can hear the clicking of the drive but it's not terribly noticeable while watching TV. The power supply is semi-modular so that helped a bit with tucking all these cables away where the front fan has an open area to blow air across the HDD and motherboard. I did not get a good picture of how it looked with all the cables tucker away but this case really has a lot of room provided that I did not put a DVD drive or video card in it. I just use an external USB DVD drive when I need it. 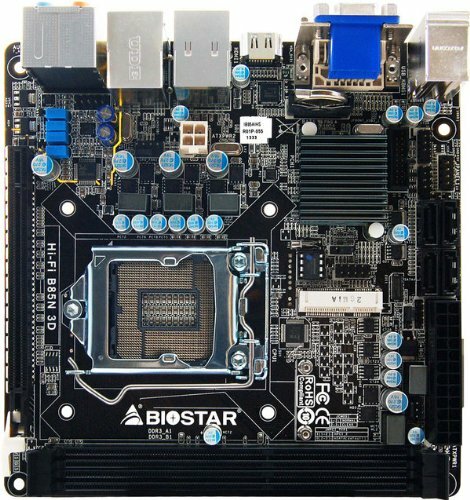 I was a little skeptical about getting a BioStar brand mother board since all my other PC's use ASRock boards but I like the Auto Power On feature. This feature saves me from having to set the OS put the PC to sleep at night so instead a scheduled task shuts it down at night then powers it back on the next morning ready to go. The motherboard looks pretty well built and has PCI Express along with BioRemote that allows you to remote control your PC from an Android or iOS device. The only thing I see lacking is software to control and monitor fan speeds via the operating system. My daughter, who attends college 4 hours away, can now watch movies in her apartment without the usual buffering issues that plagued us with the older computer so she is happy about that. I can also watch movies now without issue on my Android tablet wherever I am at. ....and yes. the cat "helped" to. I couldn't get her out of the picture so just didn't bother fighting with her. +1 for the majestic cat! Rate the parts. I'd like to hear more about your feelings on the processor and PSU, primarily. +1 for the USB DVD drive. I have been advocating that route for quite awhile now. As far as the CPU choice, I had 2 pieces of criteria that I wanted to accomplish with this build. The first was to play movies from up to 3 remote devices sometimes at the same time. According to posts in Plex forums, it has been stated that a CPU with a passmark of at least 1500 can transcode one 720p movie and 2500 for one 1080i movie. With that said, this CPU has a passmark value of 5456 (http://www.cpubenchmark.net/cpu_lookup.php?cpu=Intel+Core+i3-4350+%40+3.60GHz&id=2283) which in theory, should give me up to 3 simultaneous streams transcoding 720p movies. Most of the movies I have are 480p so I think the concurrent usage could go up more. And the second need I had was for it to act as my new VPN server running SoftEther VPN software. I chose that one because it supports L2TP. In addition, this computer will at some point also serve as my main TV box for a whole-home DVR setup. I plan on putting in a 6 channel tuner card in the expansion slot and probably use Plex HomeTheater and/or Microsoft's Media Center to control the card. But having that little extra bump, I think will help for future expansion. I think getting an I5 or higher would just be overkill for my needs so I decided to purchase a CPU that sits kind of in the middle. Plus, I wanted to keep this under $450 and think I accomplished this. As for the PSU, I did look at other lower wattage PSUs but the price was just a little more than I wanted to spend PLUS, I could not find one that had lower wattage and was in black so it would match the case. 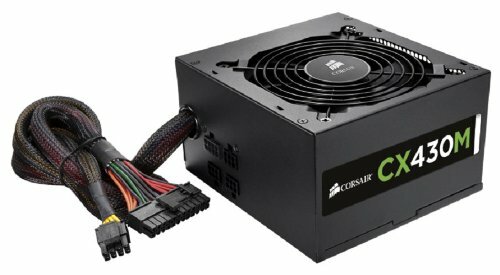 I decided on this one because I already own another Cosair CS450 model PSU that runs very quiet and have not had any problems out of it. Plus the CX430m is semi-modular so I was able to use only 1 cable to power the HDD and put a splitter to power the case fan and the small 80mm fan in the back all from the motherboards fan connector. I did turn the PSU upside down where the fan is pulling outside air rather than pulling air from inside and blowing it out. I hear that either way, it works for others and some not so much so just following the majority rule on this one. I will continue to watch the temps after a few weeks then may switch it and see what I get after doing that, but all in all, I think my reason for this PSU was primarily because I already own one and happy with it abdthe color matched and was priced well for my needs. Forgot to mention that the PSU fan is the loudest fan on this build but using the word "loud" is comparing it to the quiet Noctua fans so in all this computer is still very quiet in my opinion. Other thoughts: I probably could've gone water cooled for the CPU cooler and spend an extra $30 because this is a dedicated Plex media box that is powered on for 14 hours per day but I worry about the possibility of leaks. But thank you for the feedback! It is interesting to hear other peoples thoughts on things like this.. helps others take this information and use it to help build more streamlined systems with little waste and cost savings. It does! It runs VERY quiet , even after I removed the Low Noise Adapter to help move air a little more. Unless you walk right up to it, you really can't hear it sitting across the room. +1 Looks great and good parts. I might build one of these for myself. Plus cool cat. Update on this build as far as CPU temperatures goes and motherboard. The idle temp is still between 31 and 32C but the temp for the CPU when under load seems to never get over 58C. The only thing I did different was put the Low Noise adapter on the Noctua NF-S12A fan (?). But it runs even quieter than it did before so just leaving it alone now! Update on motherboard: The BioStar motherboard has limited software utilities to control CPU fan speed or other functions for the motherboard so if I wanted to enable Fan speed profiles, I have to do all that from the BIOS. I would also recommend that you enable the Smart Fan Control (disabled by default) in the BIOS along with thermal shutdown for CPU temperatures over 72C (disabled by default). I do love the fact that this motherboard supports the AutoPower on feature so it can shut down late at night then power back up on it's own in the mid morning hours. Case fan and CPU fan - These fans run great and are silent with the low noise adapters connected. I only connected one to the case fan and not the CPU cooler fan. All in all though, the system is performing very well and can run 2 remote 720p streams that are transcoding while streaming a local 1080i movie to one of the TV's in the other rooms. The CPU utilitzation plateaued at 70% with a temperature of 50C. what in the world is that?? I have the "Sandy Bridge" version of the i3 but 8GB of ram and 120GB SSD drive with an additional 500GB HDD for apps and files, and the computer has never faulted. I can have 10 tabs open in Chrome and various other programs running with no issues. IMHO, I recommend an i5 or higher when using the pc for transcoding or gaming.. but that is just my 2 cents. I just noticed the price of the CPU and fan I have to say I did not pay those prices. CPU was $129.99 on micropc and $37 on NewEgg. Possibly, but I plan on installing a 6 channel tuner card inside this case later on to function as my primary cable STB/DVR for all my TVs. I looked at the Intel NUCs and those were a little more out of my price range for what I wanted and just having something where I can keep everything in one box to make it look cleaner is my goal. This build is a dedicated Plex and VPN box so will not be using it for gaming or surfing of anykind.